So I’m sure you’ve all heard of the new trend of “freak” milkshakes, they’ve been all over Instagram I’m sure. Although, we never knew them as this freak milkshake, we first saw these in Lucky Fox in Sheffield, then we found a place in London and pretty much all around the world. So as the foodies that we are, we wanted to take on the challenge and make our own. If this caught first attempt of this delicious masterpiece got your attention, then watch this space, this is only the beginning – we’re planning to experiment with flavours and designs – bigger and better!! 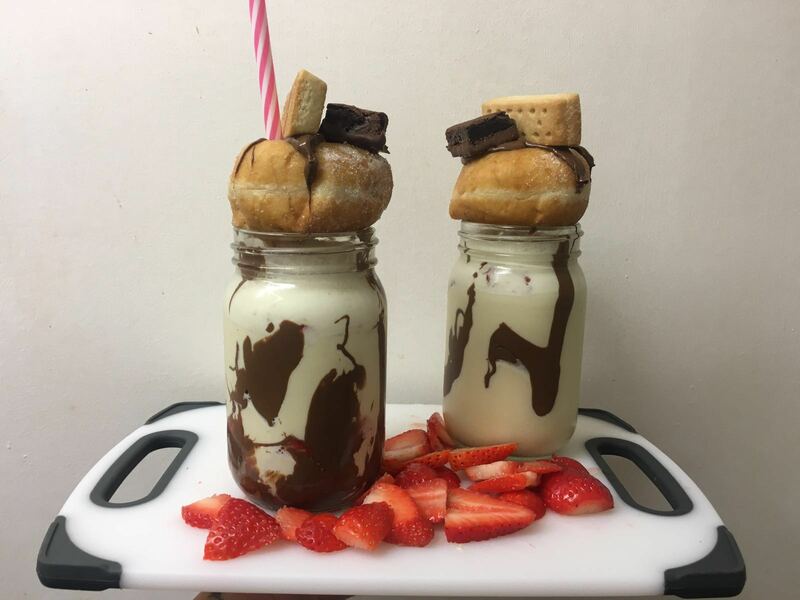 Side note: this is so money friendly, considering if you went somewhere to buy this milkshake, let’s say it cost you about £7, we spent around £10 for these ingredients and managed to make 3 (and enough to make at least 2 more) and it’s fun, to create and design your own. Also, we have an alternative if you don’t have a blender! Milkshake: We decided to go for the standard vanilla milkshake to start with, as as you can see, there was plenty more to make up for it. So, no blender – not so interesting story, we thought we had two blenders to looking for none. So here is our alternative, simply get another jar (one like you are using) with a lid, put 4 scoops (depending on the size of your jar) and fill over half way of whole milk and just simply, shake it up, shake it up. Want to add fruit flavour I hear you ask? Well with berries, I would suggest to mash them up and add them to your mix and shake! On Top: We placed on top of the filled jar a full raspberry doughnut, drizzled in melted nutella and to use as a glue to hold the brownie piece on the side, along with a shortbread biscuit in the middle with a fancy straw of your choice. What’s your favourite flavour milkshake? We’d love to see how you would make yours! Tag us!